I started my career with Bradleys in July 2016 in the Customer Services department as an Apprentice. 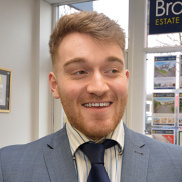 I hadn’t ever planned to work within estate agency but when I saw the opportunity, I really fancied it after having completed my A levels. Over the 13-month apprenticeship I grew in confidence both personally and on a business level. In July 2018, I moved from the Customer Services Team to the Exeter St Thomas to broaden my experience and knowledge. Working in a branch is not only positive in progressing my career in a job I genuinely enjoy, it also gives me a greater understanding of the differing roles within the industry. Overall I really enjoy this job and coming to work is something I look forward to believe that it will be for a long time to come!